A plug-in that captures the legendary Instant Phaser’s tape flanging simulations. 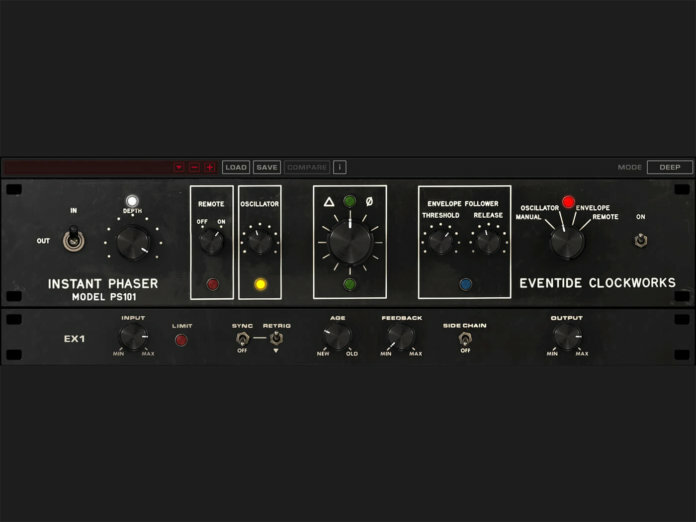 Eventide has introduced the Instant Phaser MkII, a plug-in that aims to recreate the analogue character and smooth modulations of the famed 1972 Instant Phaser. In the original hardware unit, values of some components would drift away from their marked values with the passage of time, contributing to a different sound. The plug-in’s Age knob lets you simulate this ageing process undergone by the components of phase shift networks and LFO. The plug-in offers you three types of phasing – Shallow, Deep and Wide – that are selected via the mode switch. When the Wide mode is selected, the MkII provides you with different amounts of phase-shifting on right and left channels – you can hear the contrast in effects between both ears. This phasing mode can help transform flat mono guitars into huge stereo leads, or make a single-channel synthesiser fill out the sides of a mix. The MkII comes with a neat side chain function that lets you trigger the envelope follower from a separate mix source for inter-track blending. It also has a depth knob – which sets the dry/phased signal mix – as well as sync and Retrig switches that shape the oscillator. On promotion at $37 (RRP $129). More info at eventideaudio.com.